Triple Threat: Saga Furs offers attractive exposure to three of my favourite things: Emerging Markets, Luxury Goods & Auction Houses. Supply: European/N American fur production is highly regulated (& superior to Chinese fur), with supply constrained despite generally increasing prices. Demand: High-growth/secular fur market trend in the past decade or so, driven by Western fashion/luxury revival & new emerging market demand. 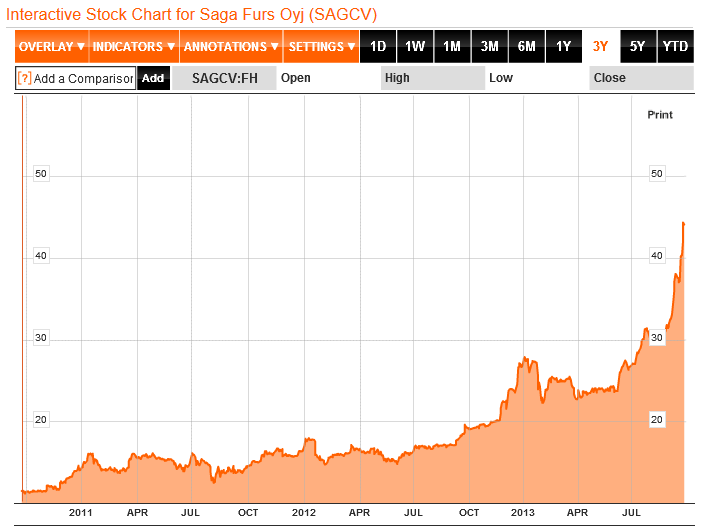 Resilience: Despite a 39% post-crisis collapse in sales, Saga’s P&L stayed close to break-even. [Aided by inversely-correlated commission rates, which increase as sales decline]. Auction sales rebounded 78% the following year. Investment: Significant percentage of Saga’s annual turnover is ploughed into expanding capacity, European/global fur lobbying, and the promotion of Saga Furs as a luxury brand. Market Share/Network Effect: Now permanent agreement with American Legend & Fur Harvesters Auction to sell via Saga auction, thereby creating some of the largest fur auctions in the world & significantly improving Saga’s effective market share. Valuation: Stock cheap in absolute terms, vs. long term earnings growth & an average adjusted operating FCF margin of 28.0%. Also cheap in relative terms, vs. auction house & luxury goods sectors. Unfortunately, the perfect storm was ready to hit: Dec-2013 auction sales collapsed 76%, as prices & the number of pelts sold dropped precipitously. Despite the about-face, initially this seemed like a bit of a buyers’ strike really…brought on by a mild winter, sticker shock (after pelt prices doubled in 3 years), higher retail inventories, and signs of slowing Russian & Chinese growth. Looking back, we know better now. It did prove to be a temporary buyers’ strike (as I’ll highlight below), but clearly the December auction heralded a more serious & sustained market disruption – the Chinese crackdown on luxury gifts was just gathering momentum at the time, and Putin was on the verge of sending the Russian economy (& ruble) over a cliff by backing military intervention in Ukraine. i) Emerging Markets: No surprise there, I recently posted a detailed write-up of my emerging (& frontier) markets investment thesis. They enjoy some key advantages – younger/faster growing populations (with far lower entitlements), labour costs that are a fraction of developed market costs, control of a major portion of the world’s natural resources, low/stable debt ratios, a 50% share of world GDP, and GDP growth expected to be twice that of developed markets. And all this is offered at a discount!? ii) Luxury Goods: I’ve an enduring faith in human vanity & insecurity – luxury goods companies have long existed to satisfy those traits. By selling dreams, status, taste, style, heritage, exclusivity…basically wants, not needs. But needs can usually be satisfied at a fair price, while wants are often infinite & indifferent to price. Of course, this creates a v desirable opportunity for companies – high-margin annuity revenue streams.